Riverside Hotel is a different type of Hotel. Along with serving guests on a daily basis as an accommodation provider, we also offer Apartments to be rented on a long term basis. Furthermore, we also operate as an investment property, with each apartment / hotel room being individually owned. 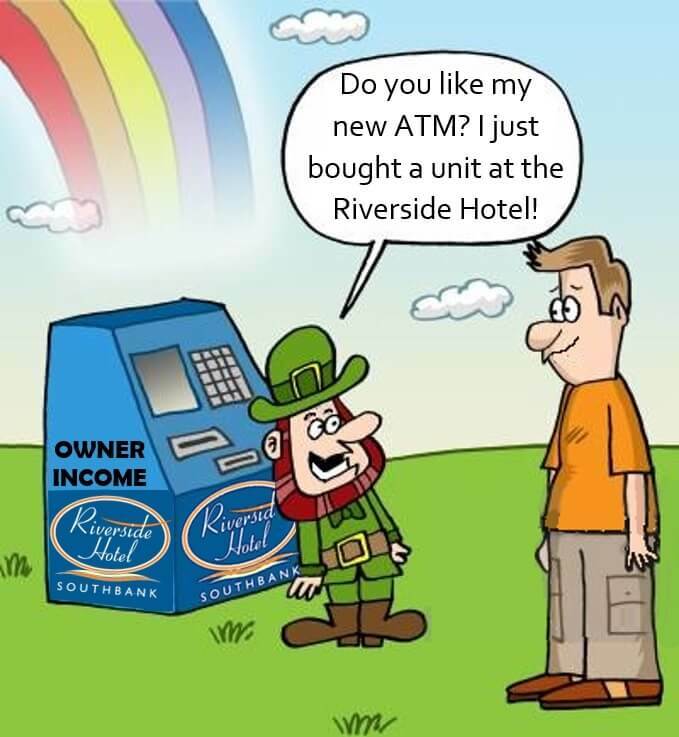 With a guaranteed return on investment, allow Riverside Hotel to make you money! Indulge yourself to a Hotel treatment, Reception open 7 days a week at your service and more with this Fully Furnished One Bedroom Apartment in South Bank. Unbeatable location, close to everything, with Hotel team available every day of the week for you. In addition, this apartment has two air conditioning units and one undercover secure car parking spot. Located in the heart of South Bank, walking distance to Brisbane CBD, 5 minutes to Bus, Trains and CityCat stops, South Bank Parklands, etc. All utilities (WI-FI, electricity, water and gas) are included in the weekly rental, therefore, there are no hidden fees. We are a Hotel, hence you will have our reception desk available 7 days a week if any needs arise. We also have an on-site Restaurant which is available 7 days a week, providing even room service should you require. Our fully licensed bar and outdoor courtyard area provide a perfect space to welcome friends, not to mention the pool area on hot summer days. Be a guest, but also be an owner! Riverside Hotel offers a much higher percentage return on investment than the average in Brisbane and our occupancy rates repeatedly hit record numbers, making this a unique opportunity. Look forward to a solid, GUARANTEED income and peace of mind! You will know your investment is being looked after by a reputable in-house Management Team – the best in the business. We are available for inspections from Monday – Friday between 9am and 5 pm. Please call to arrange a suitable time.